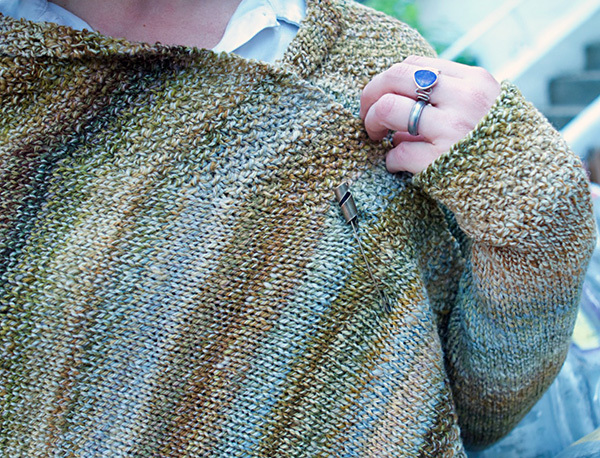 Hopoholic is The Sweater for those autumn weekends when the air starts to get a bit crisp, the sky gets a bit bluer, and hanging out in the local pub's garden requires a bit more insulation as the afternoon wears on. 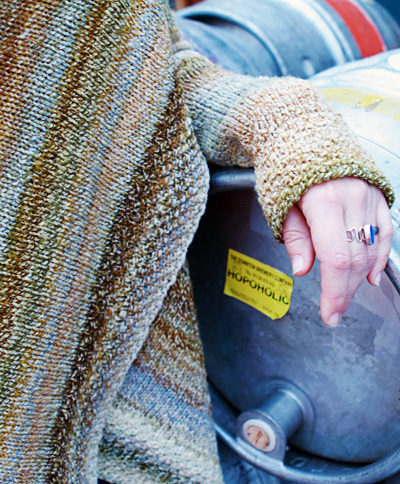 This comfy, cozy cardigan combines handspun yarn with a completely seamless construction for the perfect woolly hug for your weekend endeavors, with or without a hoppy pint in hand. Beginning from the center back, the sweater is worked sideways to the shoulders, and waste yarn is used to create afterthought sleeves. The fronts are then worked to the desired length: as wide as the back for a super cuddly garment, or slightly shorter if you've got a bit less yarn to work with. Sleeves are worked down from the armholes with short row shaping for the sleeve caps, and end in deep moss stitch cuffs that mirror the hem and collar. Leave the fronts open for a casual look, or use your favorite shawl pin to snuggle them under your chin for extra warmth. 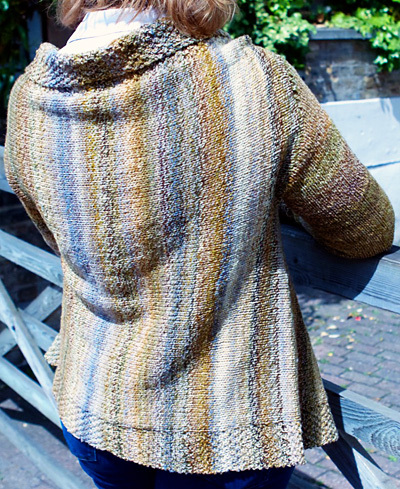 The yarn used in this sweater was a combination of fibers and colors — I spun two plies of Portuguese Merino and one ply of Targhee to blend two colorways from the Hello Yarn Fiber Club. The sweater is worked from the center back outwards to the fronts, with afterthought sleeves added in after the fronts are finished. If you are concerned about having enough yardage, I recommend doing the following to make sure the sleeves are long enough: work each side of the back past the armholes, stopping when you've worked 2-3 inches of the front past the armhole waste yarn. Next, work the sleeves to the desired length so you know they'll be long enough. Then return to the fronts, and work them for as long as you can before running out of yarn. Rows 1 & 2: *K1, p1; repeat from * to end. Rows 3 & 4: *P1, k1; repeat from * to end. Provisionally CO 104[112, 120, 120, 124/124, 124, 128, 128] sts. Set-Up Row 1 [RS]: Work Moss Stitch for 24 sts, pm, k to last 12 sts, pm, work in Moss Stitch to end. Set-Up Row 2 [WS]: Work Moss Stitch to m, p to m, work Moss Stitch to end. Continue in this manner until the left back measures 7.5[8.5, 9.5, 10.5, 11.5/12.5, 13.5, 14.5, 15.5] inches from provisional cast on. Next Row [RS]: Work Moss Stitch to m, k8. With waste yarn, k26[28, 30, 32, 34/36, 38, 40, 42] sts; transfer these stitches back to the LH needle and knit again with working yarn, work in patt to end. The waste yarn indicates the afterthought sleeve placement. Dec Row [RS]: Work to 2 sts before m, work 2 sts together (k2tog or p2tog as appropriate to maintain the stitch pattern), sm, work in patt to end. Rep Dec Row every 4[4, 6, 6, 6/8, 8, 8, 8] rows 12 times total — 12 collar stitches remain in all sizes. Continue to work the Left Front until it measures 12[14, 16, 18, 20/22, 24, 26, 28] inches from sleeve placement (waste yarn), or 3 inches less then the desired length. Work in Moss Stitch for 3 inches following from edges correctly. Return to the provisional cast on and pick up 104[112, 120, 120, 124/124, 124, 128, 128] sts. Maintaining Moss Stitch edges correctly, work in patt until Back measures 15[17, 19, 21, 23/25, 27, 29, 31] inches from the Left Sleeve placement (waste yarn). Next Row [RS]: Work 12 sts in Moss Stitch, k34[40, 46, 44, 46/44, 42, 44, 42] sts. With waste yarn, k26[28, 30, 32, 34/36, 38, 40, 42] sts; transfer these stitches back to the LH needle and knit again with working yarn, work in patt to end. The waste yarn indicates the afterthought Right Sleeve placement. Dec Row [RS]: Work to second m, sm, work 2 sts together (k2tog or p2tog as appropriate to maintain the stitch pattern), work in patt to end. Continue to work the Right Front until it is 12[14, 16, 18, 20/22, 24, 26, 28] inches long from the right armhole, or 3 inches less then the desired length. With a spare smaller circular needle, pick up 52[56, 60, 64, 68/72, 76, 80, 84] sts around the afterthought armhole — 26[28, 30, 32, 34/36, 38, 40, 42] on each side — and carefully pick out the waste yarn. Beginning at the underarm, pick up and k 1 st from gap at bottom of armhole, k26[28, 30, 32, 34/36, 38, 40, 42] sts, pick up and k 1 st from gap at top of armhole, k26[28, 30, 32, 34/36, 38, 40, 42] sts, pm for start of rnd. 54[58, 62, 66, 70/74, 78, 82, 86] sts total. Short Row 1 [RS]: K30[33, 35, 38, 41/43, 49, 52, 54] sts, ssk, w&t. Short Row 2 [WS]: P7[9, 9, 11, 13/13, 20, 22, 22] sts, p2tog, w&t. Short Row 3 [RS]: K to wrapped st, pick up wrap and ssk over (wrapped stitch, its wrap and the next st together), w&t. Short Row 4 [WS]: P to wrapped st, pick up wrap and p2tog over (wrapped stitch, its wrap and the next st), w&t. Rep the last 2 rows 2[3, 3, 3, 2/0, 1, 1, 1] more time(s). 46[48, 52, 56, 62/70, 72, 76, 80] sts remain. Continue the sleeve cap shaping, working Short Rows 3 and 4 as described until you can no longer work a complete short row on the next RS row. Resume working in the round, picking up wraps and working them with their stitches as you reach them. Rep Dec Rnd every 12th[12th, 10th, 9th, 7th/6th, 6th, 5th, 5th] rnd 6[6, 8, 9, 11/14, 15, 17, 18] more times 32[34, 34, 36, 38/40, 40, 40, 42] sts remain. Work until sleeve is 16.5[17, 17, 17.5, 17.5/18, 18, 18.5, 18.5] inches, or 3 inches less then desired length. Work in Moss Stitch for 3 inches. Weave in all ends. If there are gaps at the top and bottom of the armhole, use a small length of yarn to tighten up these areas. 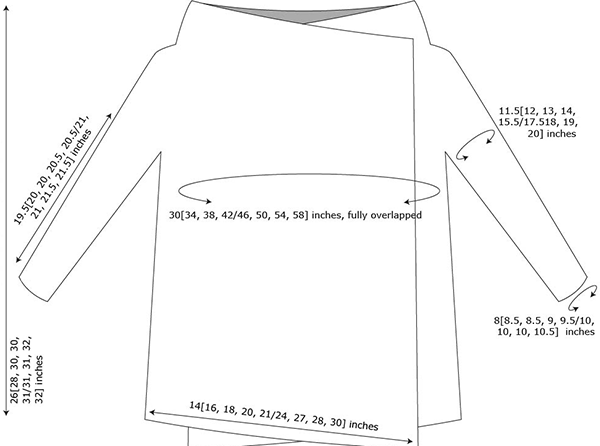 Wet block and lay flat to dry, shaping sweater to match schematic measurements. Rachel Brown is an ex-Bostonian now living in London by way of southeast Texas. 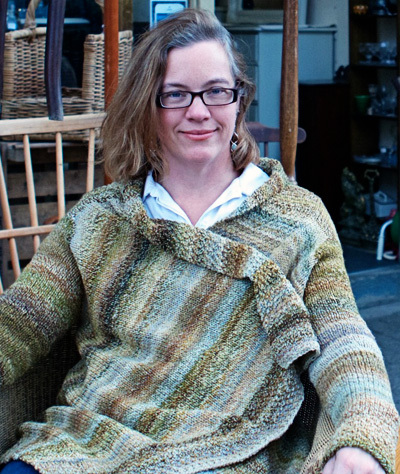 When she's not knitting, she's likely to be spinning or dyeing up fiber for her online shop, or wrangling other people's design creations into their clearest form as a freelance technical editor for independent knitwear designers. 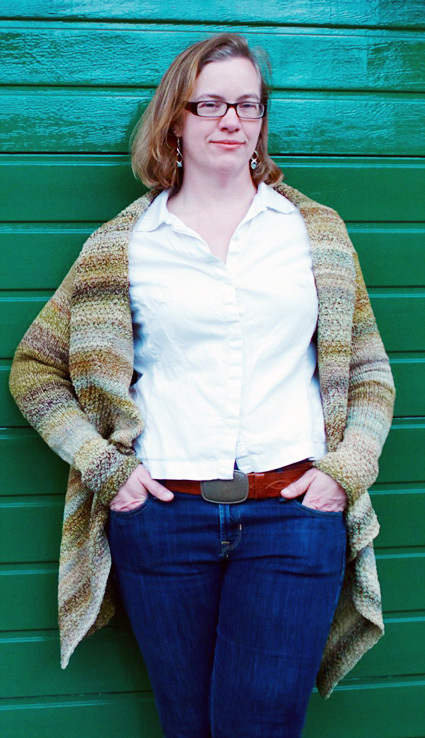 In addition to adventures in wool, she is one half of the dynamic duo behind Yarn in the City, organizing knitting and yarn-related events in and around London, and generally trying to build as large a fiber community as possible. 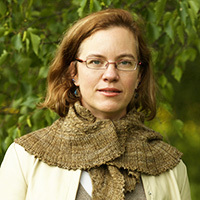 You can find her further knitting/designing/spinning adventures on her website.